Dear future cruisers, if you plan to visit the Chesapeake Bay I have two words for you; mosquito netting. Oh wait! Let’s make that five words; mosquito netting and fly swatters. I have found these items to be as necessary as cooking pots and sunscreen. Nothing more needs to be said. Maybe more does need to be said: I have a new purpose. It is killing flies. I will take the flies over the heat we had further south…but not by much. It was almost a tossup. At least you can see the flies, the No-See-Ums are the ones that really get you. I do have a bit of a dilemma; which goes on first, the sunscreen or bug spray? Do they make one that does both? I think when you enter the Chesapeake Bay there should be a Welcome Center for boaters. They would hand out a bag with a fly swatter, insect repellent and jellyfish sting antiserum, which is not a thing but should be. Maybe a drive through/sail through lane for weekend visitors in a hurry. There are a lot of boats in a hurry here. They could sell line cutters for the inevitable accidental tangles with crab pots. They’d make a fortune. 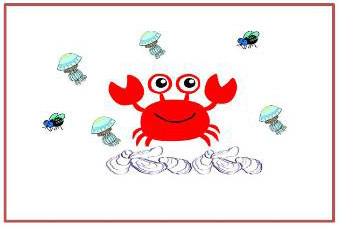 I think the bay should have its own flag; a crab in the center sitting on a round obstruction sign (used for oyster beds) surrounded by jellyfish and dotted with huge flies. I’d put No-See-Ums on the flag too but you wouldn’t be able to see them so why bother?